Many of our seller users can see that there are a few Time terms in our seller Center, but still are confused with the specific meanings of them. Updated time: The most recent tracking time with information change(including time, location, event); for the orders that are first synchronized to the 17TRACK account, the added time refers to the synchronized time. 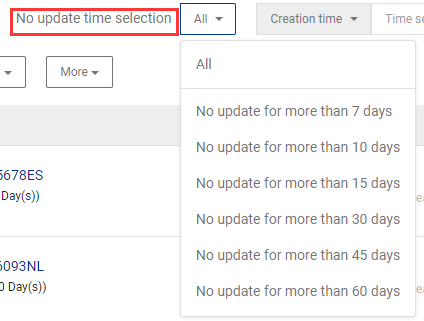 No update time: it is calculated by subtracting the update time from the recent time, which is used to check for how many days the shipments have not been updated. Event time: The time of last event/the newest event. Added time: It refers to the time when the orders are synchronized to the Seller center; if the numbers are added manually, it means that added time. Order time: It means the time when the buyers place the order in the platform. Shipping time: The time when the orders are marked as shipped in the platform. Transit time: It is calculated by subtracting the shipping time from the recent time, so you can know how long your parcels have been in transit. Delivery time: It is calculating by subtracting the first event time from the last event time, which is used to measure the delivery timeliness and efficiency of the carrier. Kargom bir yerde takıldı; bilgilendirmeyi güncelleyebilir misiniz?